The Casa de Garcia brand is known for being a high-quality hand-rolled premium cigar offered as an affordable option to other more expensive cigars currently are on the market. The Casa de Garcia Sumatra Blend is no exception. Each of these hand-made cigars are crafted in the Dominican Republic with an aged blend of Honduran and Dominican long filler tobaccos, a smooth Connecticut broadleaf binder and rolled up inside a deliciously rich tasting Sumatra wrapper. The results of this perfect combination of fine tobaccos produces a mellow, flavorful smoking experience that’s easy on the wallet, pleasant to the senses and overall relaxing and enjoyable to the body and soul. 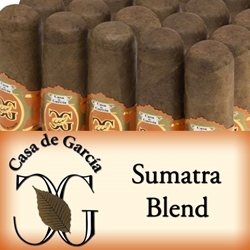 Smokers Discounts believes you'll love Casa de Garcia Sumatra premium cigars. We’ve made it easy and affordable to buy these hand-rolled cigars online. A variety of sizes and flavors are listed below at our discount online cigar store. Each of these styles are in stock and available today at a low affordable price! Call us for more details!